Also sprach Kubrick und Clarke. Long before Douglas Adams, in 2001: A SPACE ODYSSEY, Stanley Kubrick and Arthur C. Clarke tackle Life, the Universe and Everything. With the simple placement of an inexplicable, anachronous object – The Monolith – Clarke and Kubrick forge the best “true science fiction” adventure of all time. For this is how a truly “alien” intelligence might come amongst us – not in papier-mâché flying saucers or as disguised humans – but in the form of a seemingly benign message of superiority as non-intrusive as a hammer. The adventure begins with primeval ancestors of mankind – ape-like beings struggling for existence in a prehistoric African veldt – who come upon The Monolith, which acts as a stimulant for their latent intelligence. Soon these man-apes have conquered their surroundings through power, realized in the simple wielding of a femur bone. The action leaps ahead in what Clarke calls “the longest flash-forward in the history of movies” – three million years, to 2001, when a manned moon base uncovers a Monolith not unlike that which woke our ancestors from their bestial slumber in prehistoric Africa. It is, like its prehistoric brother, black, featureless, light-absorbent and an utter mystery. After emitting a startling radio signal aimed at Jupiter, it falls silent. Cut forward once again, to the spaceship Discovery, on a mission to Jupiter to find out exactly why the Monolith spoke its single syllable there. After first viewing 2001, you will dismiss Kubrick as indulging his inner hippie-chick with random futuristic images burdened with faux-portent due to the elitist soundtrack. 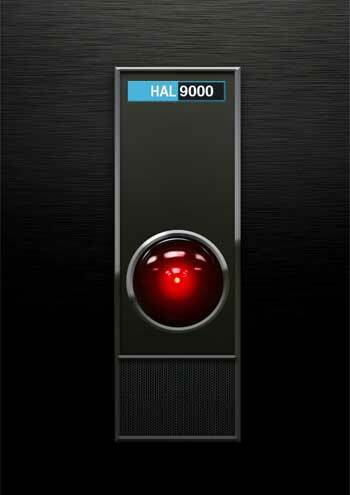 After the second viewing, you will be contemplating which room of your house to sacrifice to your Kubrick Shrine. With a soundtrack so lush and awe-inspiring it kept hippies and music enthusiasts alike rooted to their seats in expectation, 2001 forged a new vernacular for the “sound of space.” By applying well-known source music to his film, Kubrick breathed new life into Johann Strauss’ The Blue Danube, György Ligeti’s Lux Aeterna and Atmosphères, and of course, Richard Strauss’ Also sprach Zarathustra (“Thus Spoke Zarathustra”), the movie’s euphoric main theme, with its elegant horns, glittering organ and pounding timpani standing on hind legs and beating its chest like an alpha silverback. As Arthur C. Clarke has grown nauseated in telling, 2001 was not only culled from his short story The Sentinel, but from six other tales as well: Breaking Strain, Out of the Cradle, Endlessly Orbiting…, Who’s There, Into The Comet and Before Eden. With such a powerfully understated and enigmatic performance in both this movie and its inferior sequel, 2010: ODYSSEY TWO (1984), it is unlikely that Keir Dullea will ever be remembered for anything else – and unlikely that he will ever be forgotten. 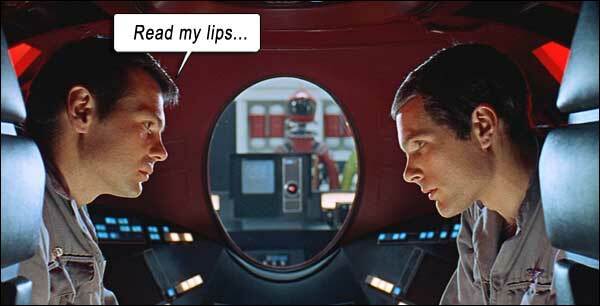 Dullea is Dave Bowman, who, along with fellow astronaut Frank Poole (Gary Lockwood) faces the adversity not only of the Monolith’s mysteries, but of their malfunctioning onboard computer, the HAL 9000 (Heuristically programmed ALgorithmic computer). Speaking in tongues, Kubrick and Clarke swirl Bowman through anomalies in the space-time continuum and craft a resolution to Life itself. With Bowman’s transmogrification to that of Star-Child, his essence having sloughed off physical flesh, the final frames of 2001 find his rebirthed cosmic embryo looking back on an Earth not only distant in space, but metaphorically as well. Released in 1968, utilizing the solid science of its time, Clarke and Kubrick not only achieved Kubrick’s dream of making the proverbial “really good science fiction film,” but gave their audience over to the most cerebral speculations known outside the marijuana-drenched hippie community. How to wrap our minds around nothing less than the power that engines the universe? Dave Bowman’s transcendence is not a death – it is a subsuming. (As Carl Sagan epically notes, “We are all starstuff.”) With no mysticism or religion intimated, it is a grand vision of all things being one. Of all man’s adventures of discovery, when our minds are thus freed, it will be our grandest odyssey of all. Thus spoke Kubrick and Clarke. 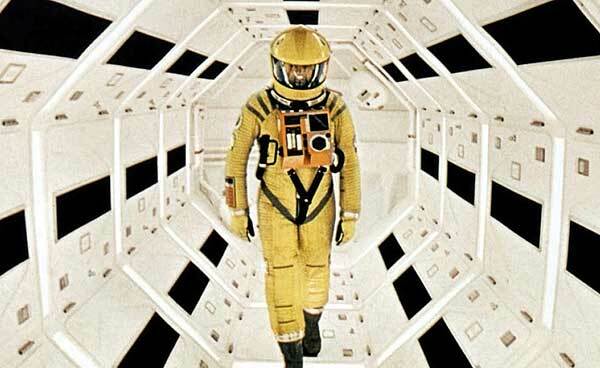 Writers: Arthur C. Clarke, Stanley Kubrick. Starring: Keir Dullea, Gary Lockwood, William Sylvester, Daniel Richter, Leonard Rossiter, Margaret Tyzack, Robert Beatty, Sean Sullivan, Douglas Rain.